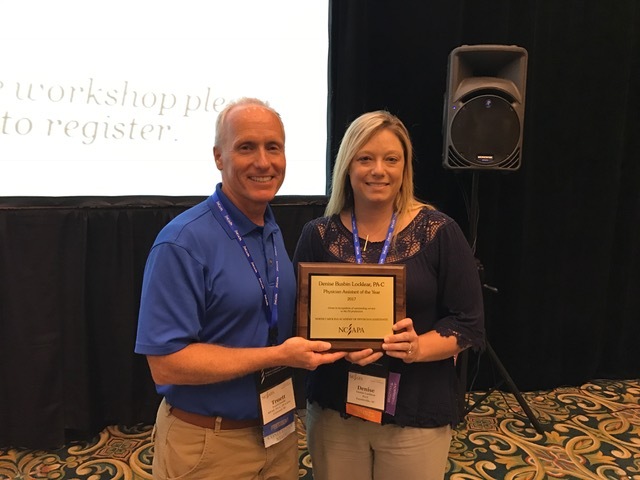 NCAPA’s PA of the Year award honors a PA who has demonstrated exemplary service to the profession and the community, and who has furthered the image of the PA profession while providing significant contributions to the health of the citizens of North Carolina. “Denise is very compassionate with her patients and spends extra time with them, to assure they obtain the help they need. Pain Management can be a very difficult field due to the patient demands and current opioid epidemic. Even when the job is stressful for her, she goes above and beyond for patients and refuses to leave them for an “easier” specialty. She has worked with a local coalition in Fayetteville to improve care and resources for patients when they are faced with addiction. This coalition was responsible for getting project Lazarus to give Narcan to local police and first responders, since Fayetteville has a high rate of opioid overdose. She regularly attends local meetings with colleagues in various fields to discuss the opioid crisis and to work as a local community to decrease the harmful effects that excessive opioid prescribing has had on many North Carolinians. Denise also regularly precepts PA students and has taught students at Methodist University about pain and related medications. The PA of the Year award was presented to Denise Locklear during the 41st Annual Summer Conference on Monday, August 21, 2017.